Did the Samsung Galaxy S4 with Snapdragon 800 get snapped by a blogger? A possible Samsung Galaxy S4 powered by the Snapdragon 800 processor has had the rumour mills running hot since yesterday, and now a photograph of an S4 look-a-like has popped up on the same day as the Samsung Premier 2013 event. Photographed by micro-blogger Palm, Slashgear believes it could very well be Samsung's Snapdragon 800 iteration of its S4 because of the physical similarities, including its button placing and wallpaper set. 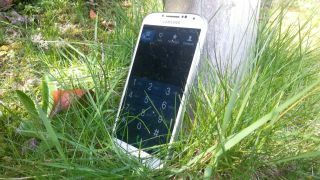 The phone is shown to be in a casing, which Samsung has used previously on unreleased phones. Timing and coincidences aside, it's probably best to take this photograph with a helping of salt without any sort of official announcements or confirmations on if the phone even exists. Earlier we reported another clue to signify a possible S4 variant in the form of a user manual. As an unlikely clue, the online manual for a South Korean device known as the SHV-E330S shows that it has Qualcomm's new Snapdragon 800 processor. If this device ends up being an S4 variant, it would support LTE-advanced, 2.3GHz quad-core processing and Adreno 330 graphics, with the possibility of 4K video output. With so little known about Samsung's plans for the phone, if an S4 variant did become a reality, it might not even be released in the West.